I have tried to leave behind me the casualties of the Battle of the Somme, which is difficult: more than 1,000,000 casualties! Lest we forget. However, while writing the Weeping Angel of Amiens, I discovered the above painting featuring a delightful mise en abyme. The glass ball creates a mirror effect, which is an example of the illusionism of the Golden Age of Dutch painting, the 17th century. 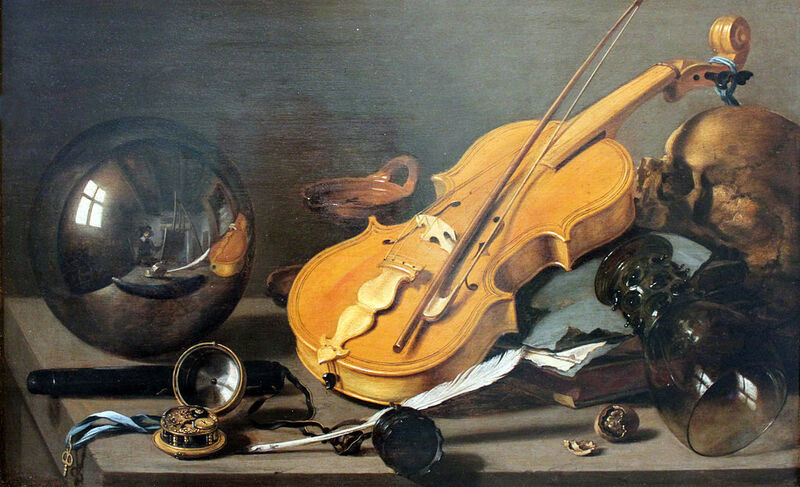 Moreover, the violin depicted by Pieter Claesz, was placed between a clock, a substitute for an hourglass, and a skull. The painting is a vanitas as is the painting of our chubby Weeping Angel of Amiens. At the foot of this post, I have inserted a video featuring the works of Heda Willem Claesz. He and Pieter were not relatives, but Pieter very much admired Willem Claesz and both painted vanitas, a subject matter of still lifes. 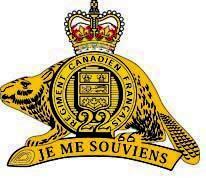 Writing the Weeping Angel of Amiens, I discovered when and how the Royal 22nd Regiment, or le Royal 22e Régiment, a French-Canadian regiment called the “Van Doos” by Anglophones and aficionados. No, it is not a Dutch name. It’s “vingt-deux” (22). Members of the regiment called themselves “Canadiens,” as in the Montreal hockey team. The Canadiens hockey team was named after the singing and very strong “voyageurs” who faced death every day, but sang in unison as they paddled their way to beaver felts and accompanied explorers all the way to the Pacific Ocean. Their success is due to a dare-devil mentality, their ability to work as a team, their basic joie de vivre and their close relationship with Amerindians. Amerindians were the voyageurs‘ guides and voyageurs spoke Amerindian languages. Well, the “Van Doos” also sang in the middle of the Battle of the Somme (1st July 1916 – 18th November 1916) and called themselves Canadiens. Traditionally, French-Canadians have refused to go to war. They opposed conscription during both World War I (see War Museum) and World War II (see War Museum) and oppose, but not altogether, Canada’s military engagement in the struggle against Isis, not Islam. However, despite their wish not to join the military, they have on occasion volunteered to do so. 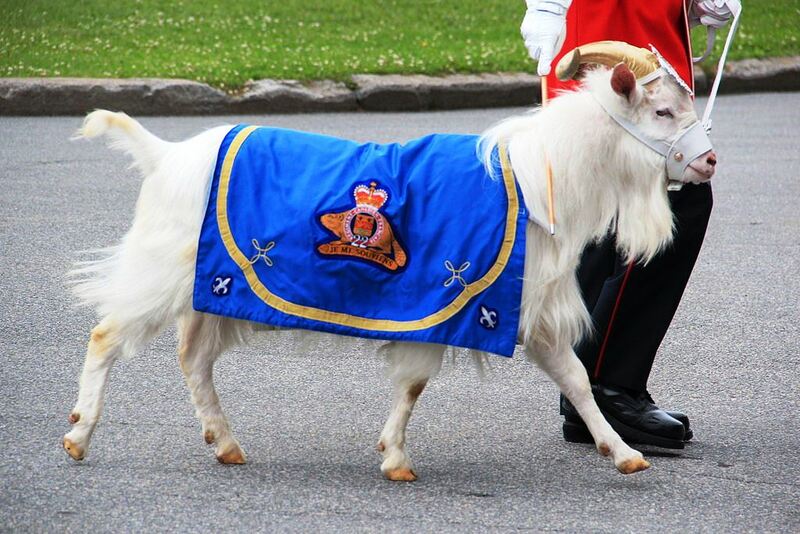 Such is the case with the future Royal 22nd Regiment, which was formed in 1914. In fact, before the “Van Doos” regiment was created, 1,000 French-Canadian soldiers had been recruited and scattered here and there in the Canadian Expeditionary Force (CEF), in not too honourable a fashion. Matters changed when Arthur Mignault, a medical doctor and a wealthy French-Canadian pharmaceutical entrepreneur, offered to form a French-Canadian regiment which he would fund. 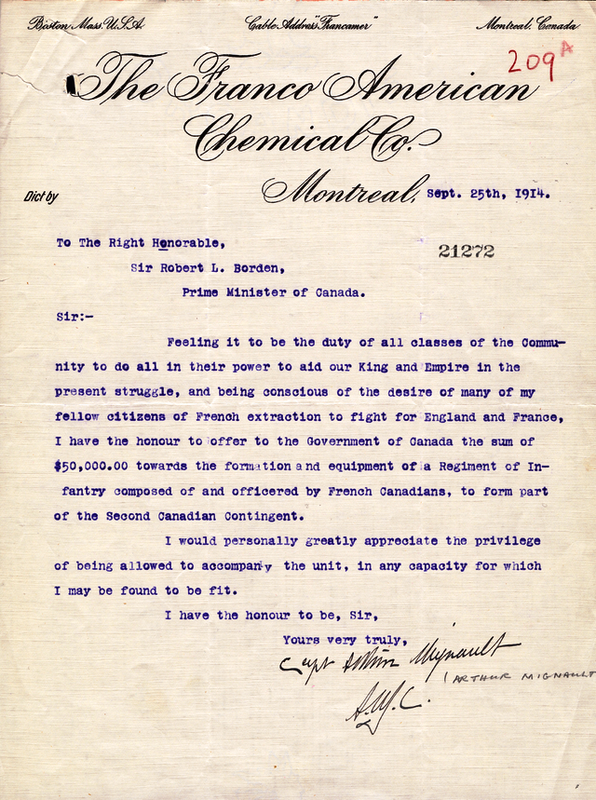 Dr Mignault’s offer was a godsend, so the creation of the unit was authorized on 14 October 1914 and members of the battalion trained at Valcartier. In September 1915, the division went overseas not as the Royal 22nd Regiment, but as the 22nd Canadian Division. Many French-Canadians scattered in the Canadian Expeditionary Force (CEF) joined the “Van Doos” after the Battle of Courcelette (15 September 1916 – 22 September 1916). “We were walking on dead soldiers… I saw poor fellows trying to bandage their wounds… bombs, heavy shells were falling all over them. Poor Angéline, it is the worst sight that a man ever wants to see… All my friends have been either killed or wounded…. On 20 May 1919, all battalions of the Canadian Expeditionary Force (CEF) were disbanded, including the 22nd Battalion. 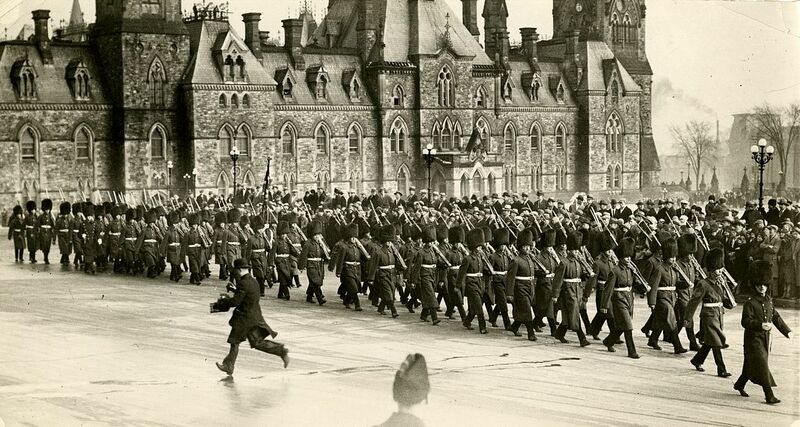 However, following World War I, Canada reorganized its military forces. As you know, many Québécois are separatists, but they will have their place in Ottawa, especially in the Canadian Military Forces.